The ‘Gunerius Quack’-moniker has been used mostly in collaboration with what remained of Ganjibiri, called ‘Dom Andra’, but this time, Gunerius goes solo. 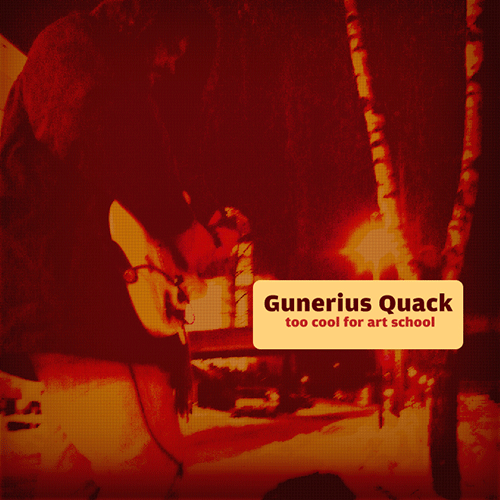 ‘Too Cool For Art School’ is not a typical Gunerius Quack release. When asked in an interview with Norwegian newspaper ‘Morgenbladet’ what kind of music he played, Gunerius absently replied; “It’s a kind of hard psychedelic free guitar/trumpet recording. Inspired by the Tetuzi Akiyama record, ‘Don’t forget to boogie!’, and picking up a trumpet for the first time. Sooner or later it will all fall down, and the acoustic experimenting of Gunerius Quack will come.” Artwork by Morten.